Medical Education Consultants, Inc. (MEDCON) is a medical education and communications company located in Westport, Connecticut. MEDCON was founded in 1997 and is operated by an experienced pharmaceutical management team who have strong relationships with the elite thought-leaders in American medicine and broad therapeutic backgrounds in both science and marketing. MEDCON is a highly integrated company providing complete strategic and tactical implementation services ranging from Account and Project Management, Editorial and Scientific Services, Conference and Travel Management, Graphic Studio, Slide Production and Duplication, internet-based communications, Grand Rounds Lecture Division, and more. 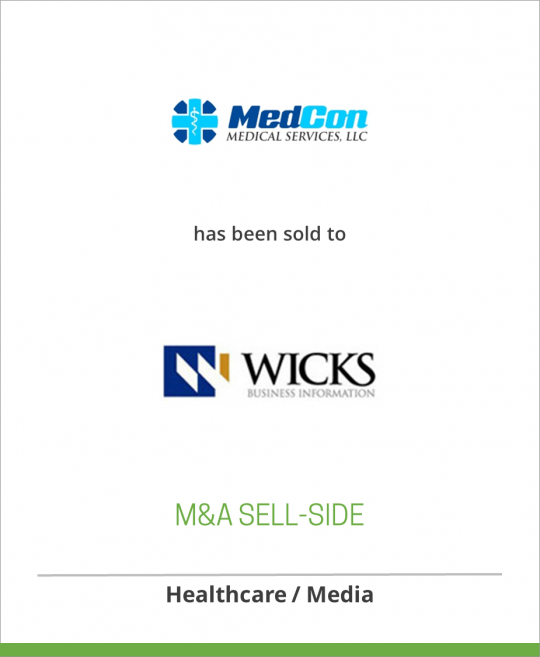 Wicks Medical Information, LLC is a newly-formed company of The Wicks Group of Companies, L.L.C. The Wicks Group is a private equity firm located in New York City which was founded in 1989. The firm is focused on selected segments of the communications, information and media industries. In 1999 and early 2000, Wicks raised $383 million for the fund. Current investments include Wicks Business Information, Wicks Television, Wicks Broadcast Solutions, Olympus Media, Delta Education and Wilts Broadcasting.